Go Green! What a great way to start your marriage off by doing something good for our environment. As the bridal couple's love is sustained for a lifetime you can show that you are concerned about sustaining the earth's resources. Choose our eco-friendly favors as social minded act of enduring love. Choose from our bamboo cheeseboard, bamboo place card holders, bamboo coasters, shell place card holders, photo album and poppers! Give your guests a plantable flower seed wedding favor that they'll be able to enjoy all season long! These wedding favors grow real flowers! Everytime your guests look out their window and see these beautiful flowers, they'll be reminded of your beautiful wedding! These wildflower seeds make great bridal shower favors and table setting for a Garden Party Shower! Be green, help the environment and plant a flower that grows like the love grows in a marriage and it will remind everyone of the nurturing love found in a marriage committment. Read Themes for a Bridal Shower Article. 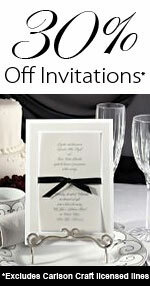 Check out other Wedding Favors, Personalized Wedding Favors, and Beach Wedding Favors.